The support of electricity generated from solid biomass is the most important stimulation for the development of the biomass power plant market. Whereas biomass subsidisation schemes have recently also experienced positive amendments in Europe, Asian countries are currently reducing this kind of support for the first time. This is one of the results of a new ecoprog market analysis. In 2018, the number of biomass power plants (BMPPs) increased again by about 300 facilities. Today, there are about 3,800 BMPPs with an installed capacity of around 60 GWel. Subsidies for renewable energies (RE) are the most important factor driving the BMPP market, especially in Europe. The markets in South and North America as well as in many Asian countries are rather stimulated by fuel availability; however, RE subsidies are an important factor for the development of new capacities in these countries as well. "some of the European biomass support schemes are more than 20 years old"
Some of the European biomass support schemes are more than 20 years old. Therefore, many such systems have been reduced and rather geared towards competitive mechanisms in the past years. In the last year, this trend slowed down to some extent. Poland, for instance, organised BMPP auctions for the first time in 2018, after the introduction had been awaited for many years. However, these auctions showed very limited success – only one project was approved for subsidies. This is because only few project developers participated, one reason for which is a wait-and-see attitude by many investors. In late 2018, Finland also introduced an auctioning system that could benefit electricity generation from biomass. Ireland passed an auctioning scheme, which should increase the establishment of renewable energies (including biomass) until 2025. Outside of Europe, the number of countries cutting biomass subsidies increased for the first time in 2018. Thailand, for instance, drastically reduced the feed-in tariff for biomass electricity, from about 14.20 €ct/kWh to 6.30 €ct/kWh. Also, Japan lowered the subsidisation for biomass projects with capacities of over 10 MWel and introduced a cap of 200 MWel per year for additional constructions. Argentina reduced the tendering volume for RE in the annual auctions from 1,200 MWel in 2017 to 400 MWel in 2018. Attractive subsidisation terms remain in place in China and India, the countries with the strongest growth potentials. In 2018, India additionally introduced a nationwide support scheme for building biomass CHP plants (based on grants for the plant construction). From a global perspective, biomass electricity subsidisation continues to promote the market development for the construction of BMPPs. 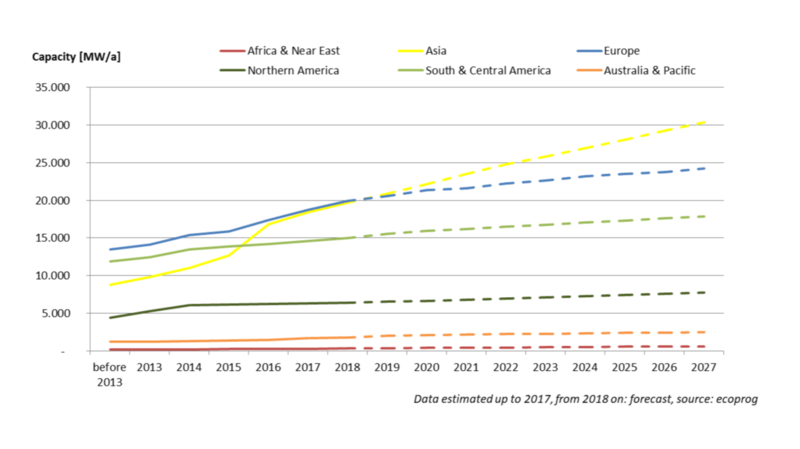 Until 2027, the worldwide market for BMPPs will thus remain on its dynamic development path. We expect the construction of about 1,900 additional biomass power plants with an installed capacity of around 25 GWel. About 50% of this growth will be realised in Asia, especially in the two lead markets China and India. Also, North and South America will remain attractive markets for electricity generation from solid biomass, and particularly their lead markets Brazil, Canada and the USA. "in Europe, the overall level of support will continue to decline"
In Europe, the overall level of support will continue to decline, in order to reduce high costs and improve ecological aspects. The positive changes of the subsidisation schemes, which were observed in 2018, will not be able to completely compensate this development. In sum, the European market will therefore lose some of its drive. ecoprog’s study “Biomass to Power” is the most comprehensive of its kind, as it is the only report based on an analysis of the actual worldwide plant portfolio, and not only on evaluating public statistics. Go to www.ecoprog.com for further information on the new, 9th edition of this analysis. As a respected strategy consultancy, Cologne-based ecoprog accompanies clients from Germany and abroad in dealing with implementation-oriented management issues with political, technical or economic backgrounds in the environmental and energy technology sectors. We focus on strategy consulting, market and competition analyses as well as multiclient studies. ecoprog is a consultancy specialising in the fields of environmental and energy technology. It has developed into a renowned expert on these markets. ecoprog’s typical activities include market and competition analyses, commercial due diligence, economic feasibility studies and material flow analyses. ecoprog was founded in 2005 as a private, limited liability company and has been responsible for more than 100 projects.